Nicotiana is a genus of annual and perennial herbs, shrubs, and small trees of the nightshade family (Solanaceae), characterized by flowers with five petals, five-lobed calyx, and alternate leaves, and typically a terminal panicle-like cyme and a fruit in the form of a capsule with a large number of small seeds. The genus includes the well-known species known as tobacco plants, which are cultivated to produce tobacco. Members of Nicotiana are indigenous to North and South America, Australia, south-west Africa, and the South Pacific. Many plants contain nicotine, a neurotoxin with particular specificity to insects, and thus helpful for protecting the plant. In low concentrations, the substance acts as a stimulant in mammals and is one of the main factors responsible for the dependence-forming properties of tobacco smoking. In many industrialized countries, nicotine is among the most significant addictive substances and a cause for medical concern. However, in preindustrial societies, tobacco smoking was commonly considered a sacred or ritual activity and tightly regulated. Smoking a Native American "peace pipe" would invariably be preceded by paying due homage to the relevant deities and spirits and sacrificing some of the tobacco. Other cultures such as the Aztecs, while smoking tobacco more casually, were nonetheless aware of the fact that it is a potent and addictive drug. Native peoples also used tobacco in other ways as an entheogen (e.g. as an additive to ayahuasca), and occasionally in ethnoveterinary medicine, for example, to rid livestock of parasites. Many species of Nicotiana are grown as ornamental plants. They are popular vespertines, their sweet-smelling flowers opening in the evening to be visited by hawkmoths and other pollinators. Several tobacco plants have been used as model organisms in genetics. 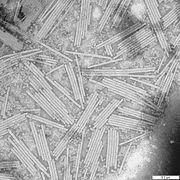 Tobacco BY-2 cells, derived from N. tabacum cultivar 'Bright Yellow-2', are among the most important research tools in plant cytology. Tobacco has played a pioneering role in callus culture research and the elucidation of the mechanism by which kinetin works, laying the groundwork for modern agricultural biotechnology. The genus Nicotiana is a member of the nightshade or potato family, Solanaceae, along with potatoes (Solanum tuberosum), tomatoes (Solanum lycopersicum), mandrakes (Mandragora officinarum), and deadly nightshade (Atropa belladonna). Flowers are typically conical or funnel in shape, with five petals, which are usually fused. The leaves are alternate, often with a hairy or clammy surface. Solanaceous plants produce a fruit that is either a berry, as in the case of the tomato or wolfberry, or is a dehiscent capsule (breaks open upon drying, or dehiscing, releasing the seeds) as in the case of Datura. The seeds are usually round and flat, being two to four millimeters in diameter. The stamens are usually present in multiples of four (most commonly four or eight). Members of Nicotiana range from desert ephermerals a few inches high, to annual herbaceous plants, to annual and perennial shrub, to perennial trees up to twenty-five feet in height (Goodspeed 1947). They exhibit a wide range in habit, inflorescence, and flower. Typically, they have an inflorescence in the form of a terminal panicle-like cyme (Hyde and Wursten 2008). Goodspeed (1947) notes however, that inflorescence types include a thyrse panicle and a flat spray as extremes, with such intermediates and specializations as mono-, di-, and pleiochasial cymes, solitary flowers, and paniculate-cymose mixtures. Nicotianas have a five-lobed calyx, which is much shorter than the corolla tube; a corolla that is white, yellow, pink, red, or purplish; and five stamens (Hyde and Wursten 2008). The fruit is a capsule with a large number of very small seeds, and the capsule is enclosed by a persistent papery calyx (Hyde and Wursten 2008). There are about 67 species in the genus, located in America (largely in Andean South America and Mexico), Australia, South Pacific Islands, and one in Namibia (Hyde and Wursten 2008). Goodspeed (1947) had identified 58 species. Various Nicotiana species, commonly referred to as tobacco plants, are cultivated and grown to produce tobacco. More than 20 species of tobacco plants have been identified. Tobacco leaves and sometimes stems are commonly used as entheogens and for pleasure. The leaves are processed into forms that can be smoked, chewed, or sniffed. Of all Nicotiana species, cultivated tobacco (N. tabacum) is the most widely planted and is grown worldwide for production of tobacco leaf for cigarettes. The genus Nicotiana is named in honor of Jean Nicot, who in 1561 was the first to present tobacco to the French royal court. Many plants contain nicotine, a powerful neurotoxin that is particularly harmful to insects. However, tobaccos contain a higher concentration of nicotine than most other plants. 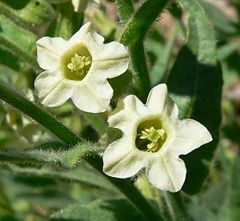 In addition, unlike many other Solanaceae, they do not contain tropane alkaloids, which are often poisonous to humans and other animals. It is interesting to note that nicotine and tropane alkaloids, such as atropine found in datura stramonium, have exactly the opposite actions in the brain. While nicotine is an agonist of acetylcholine receptors, atropine acts as an antagonist at the same receptors. 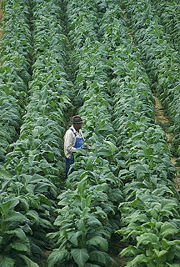 Tobacco plants were long grown and/or harvested by local peoples. The Takelma, for example, utilized N. bigelovii, and tobacco was very important to the Aztecs who considered it one of the sacred herbs of Xochipilli, the "Flower Prince" (also known as Macuilxochitl, "Five Flowers"), a deity of agriculture and especially psychoactive plants. The origins of cultivated tobacco (N. tabacum) are obscure; it is not known from the wild and appears to be a hybrid between woodland tobacco (N. sylvestris), N. tomentosiformis and another species (perhaps N. otophora), deliberately selected by humans a long time ago (Ren and Timko 2001). In modern tobacco farming, Nicotiana seeds are scattered onto the surface of the soil, as their germination is activated by light. In colonial Virginia, seedbeds were fertilized with wood ash or animal manure (frequently powdered horse manure). Coyote tobacco of the western U.S. requires burned wood to germinate (Baldwin 2001). Seedbeds were then covered with branches to protect the young plants from frost damage. These plants were left to grow until around April. Today, in the United States, unlike other countries, Nicotiana is often fertilized with the mineral apatite in order to partially starve the plant for nitrogen, which changes the taste of the tobacco. After the plants have reached a certain height, they are transplanted into fields. This was originally done by making a relatively large hole in the tilled earth with a tobacco peg, then placing the small plant in the hole. Various mechanical tobacco planters were invented throughout the late nineteenth and early twentieth century to automate this process, making a hole, fertilizing it, and guiding a plant into the hole with one motion. Despite containing enough nicotine and/or other compounds such as germacrene and anabasine and other piperidine alkaloids (varying between species) to deter most herbivores (Panter et al. 1990), a number of such animals have the ability to feed on Nicotiana species without being harmed. Nonetheless, tobacco is unpalatable to many species and therefore some tobacco plants (chiefly tree tobacco, N. glauca) have become established as invasive weeds in some places. In the nineteenth century, young tobacco plantings came under increasing attack from flea beetles (Epitrix cucumeris and/or Epitrix pubescens), causing destruction of half the United States tobacco crop in 1876. In the years afterward, many experiments were attempted and discussed to control the flea beetle. By 1880, it was discovered that replacing the branches with a frame covered by thin fabric would effectively protect plants from the beetle. This practice spread until it became ubiquitous in the 1890s. Baldwin, I. T. 2001. An ecologically motivated analysis of plant-herbivore interactions in native tobacco Plant Physiol 127: 1449-1458. Retrieved September 18, 2008. Goodspeed, T. H. 1947. On the evolution of the genus Nicotiana PNAS 33(6): 158-171. Hyde, M. A., and B. Wursten. 2008. Nicotiana Flora of Zimbabwe. Retrieved September 18, 2008. Integrated Taxonomic Information System (ITIS). 1999. Nicotiana ITIS Taxonomic Serial No. : 30562. Retrieved September 18, 2008. Panter, K. E., R.F. Keeler, T. D. Bunch, and R. J. Callan. 1990. Congenital skeletal malformations and cleft palate induced in goats by ingestion of Lupinus, Conium and Nicotiana species Toxicon 28(12): 1377-1385. PMID 2089736. Retrieved September 18, 2008. Ren, N., and M. P. Timko. 2001. AFLP analysis of genetic polymorphism and evolutionary relationships among cultivated and wild Nicotiana species Genome 44(4): 559-571. Retrieved September 18, 2008. United States Department of Agriculture (USDA). 2006. Classification Nicotiana USDA. Retrieved September 18, 2008. This page was last modified on 22 September 2008, at 18:56.